My relationship with pop culture is weird. I'm neck-deep in some things, and haven't even dipped my toes into others. I find my niches and dive deep into them while I neglect stuff that would make people question my nerd cred. I've never seen or read Harry Potter. I've never played a Pokémon game. And, until recently, I'd never seen Labyrinth. Feel free to attack me in the comments for any of that, if that's the kind of thing that excites you. Labyrinth hit theaters just over 31 years ago, on June 27, 1986. My horrified girlfriend (horrified that I had never seen it, that is) sat me down in front of her TV and I finally watched it – totally by chance – on June 27, 2017. Looking at a cult classic so far after the fact is a strange feeling. I came at something so well loved, so adored, with relatively fresh eyes. I was curious to find out how I would respond to a movie like Labyrinth, and what I might take away from it after going in with decades of movie-watching experience. Coming away from it, I see more clearly than ever a strong imagination can power through less-impressive parts of a story, turning what might've been a forgettable artifact into a cult classic beloved by droves of fans decades later. There's a lot to love about Labyrinth. There absolutely is. But all of that lovable stuff is molded around a much-less-interesting core. The story powering Labyrinth isn't interesting, and serves mostly as a clothesline upon which to hang the interesting scenes and setpieces. It isn't much more substantial than the plot of a Saturday morning cartoon. Sarah's wants and needs seem like the very definition of first-world problems, and she doesn't really change believably throughout the course of the film. So why do we hang onto it for dear life? Putting the "Special" in "Special Effects"
Perhaps the most interesting thing is to look at a movie like Labyrinth when we live in a world of realer-than-real CGI. If you grabbed someone from the past and put them in front of Avengers: Age of Ultron, they'd believe we'd mastered the technology for jet packs and flight suits. And what's really mind-blowing is just how commonplace that is. Even serial TV shows like The Flash can add relatively convincing computer effects into a television-sized budget. But we're so used to these effects that, despite how real they look, they never feel real. 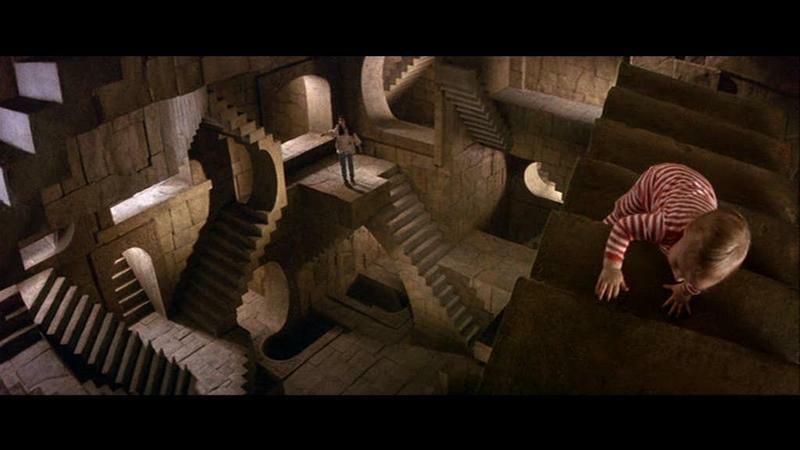 Every inch of Labyrinth, in comparison, has been touched by a human hand. Nothing in the movie is perfect, and therein lies its perfection. Everything feels real by dint of seeming lived-in and well-worn. Every Jim Henson-built character feels like a person more than an effect. Hornswoggle, for example, doesn't feel like a Muppet, even as I go back and look at pictures of the suit standing in museums and read about the process of puppeteering the suit to help make the movie. Every set is memorable, and so is every character design. Even after a single viewing of the movie, I feel like some of the characters are burned into my imagination. The weirdly haunting Fierys, the friendly Ludo, and of course Higgle, are all deeply memorable characters. And as much as the visuals of Labyrinth matter, so do the audio and script. First and foremost, Labyrinth is an immensely quotable movie, on the level as other nerd classics like Monty Python and the Holy Grail, Princess Bride, and Army of Darkness. The screenplay for Labyrinth, it's worth noting, was written by Monty Python alum Terry Jones, so that's hardly surprising. But these incredibly quotable lines mean that the movie rings back and forth between fans of the movie, keeping it alive long after it would've otherwise died. Labyrinth has something lots of 1980s fantasy movies had that few movies since have managed to replicate. It feels truly otherworldly. 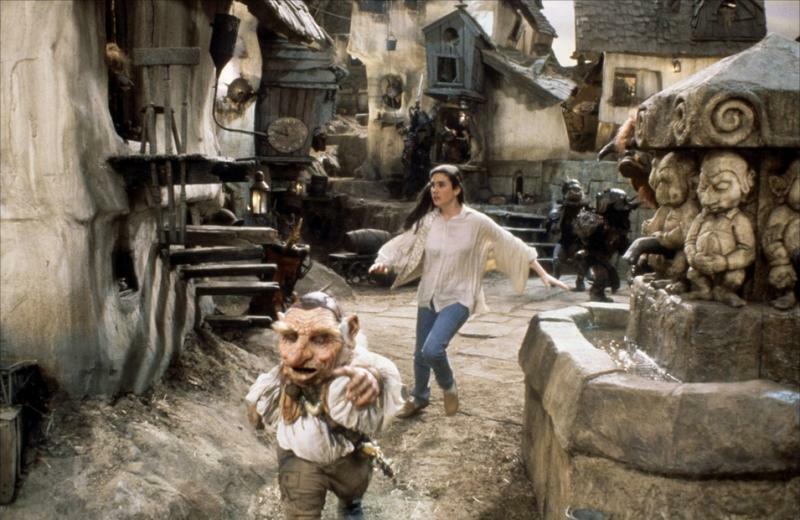 When the movie shifts from Sarah's bland home to the Goblin King's kingdom, it feels like a huge shift. It's jarring and discomforting. Every scene is packed full of places and things that, at a glance, feel like they could be explored if only the camera would linger a bit longer, if only Sarah would go the other way. Things are hinted at that the movie doesn't get a chance to explore. The soundtrack, too, contributes to this. David Bowie made huge contributions to the soundtrack, and his voice alone lends a feeling of otherworldliness. That's just David Bowie. It's worth noting here, too, that Bowie had originally planned to be an actor, and has a whole list of legitimate acting credits behind him. This isn't a prestige appearance like we so often see with rock stars in movies and tv shows. He plays a character and fully inhabits it. 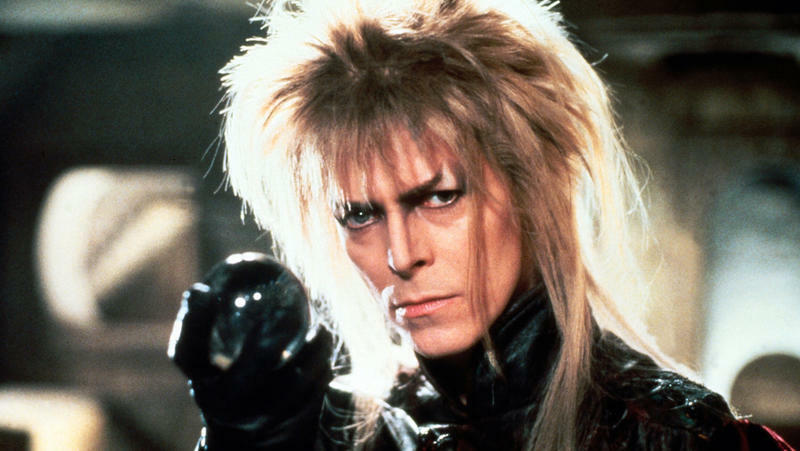 For all the jokes about David Bowie's package being a credited co-star, Bowie brings a serious presence to the film and an intensity to the Goblin King Jareth. Bowie was making weird, spooky, and unique stuff until his very last days, and his part in Labyrinth is no exception. But then there's Trevor Jones' score. The synth-heavy tracks of 1980s fantasy movies like Labyrinth sound, I think, just a bit off to our ears. Skilled synth composers are able to create some really strange, discordant sounds, and even now in 2017, the sounds still feel "wrong." They work to create a feeling of a place that doesn't and can't exist. Blade Runner's soundtrack, by Vangelis, might be the best example of this, but Labyrinth does a fine job of it. Each new scene's soundscape reminds us what a strange place the labyrinth is. Since that time, we've only seen a few movies here and there with really wondrous visuals, like Tim Burton's The Nightmare Before Christmas or Guillermo del Toro's Pan's Labyrinth (no relation), and those movies that really do capture us are, like this one, dependent on handmade visual effects. As the visual effects of movies have become fueled by computers, soundtracks, too, have become more and more similar. Movie soundtracks these days look to tell us how to feel at any given moment – sad, happy, scared – but rarely ask us to feel different, or strange. 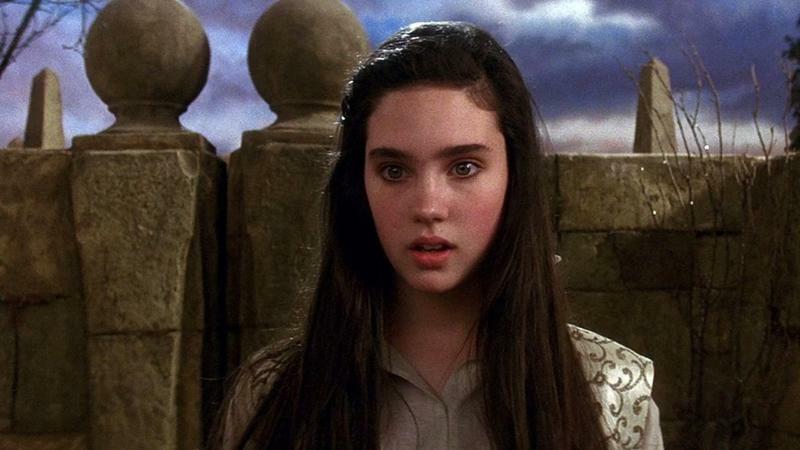 Going into Labyrinth decades late, there's no way it's going to have the same effect on me that it would've when I was 10 or 15 years old. I might be too disconnected from Sarah's simple plight or have simply seen too many movies. But even so, looking back, I can easily see what it is that people have hung onto so tightly for the last 30 years, and why my girlfriend looked at me with such horror.